Choose Redeem Card from the left-hand side menu. If you have student workers that print on behalf of your department, you should request a departmental account. After a department account is created, your student workers will be able to select the departmental account when they print. You will receive a weekly report showing the printing activity associated with the departmental account. If you need an account set up, email [email protected]. At the time of setup, you will be asked to provide a list of students that are allowed to print using the departmental account. Student groups / organizations can obtain a shared account for the group, or reimburse members who print for the group off of their personal PaperCut balance. To set up a shared account, email [email protected]. At that time, an account name, password, and reports will be configured. You will be asked to provide a list of people that can print. Setup time takes about 5 minutes. The account will be created with an initial balance of $5.00. 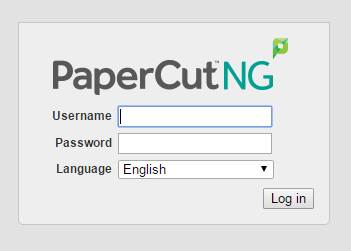 More can be added by logging into PaperCut and clicking the “Add Credit Online” menu link. The organization is responsible for distributing account login information to those students responsible for printing on behalf of the organization. The organization is responsible for any printing charged to that account. The organization will only be given one printing account.